Working under Director of Public History Dr. Benjamin Filene, six Museum Studies graduate students took on the task of recovering the hidden history of Greensboro's downtown. 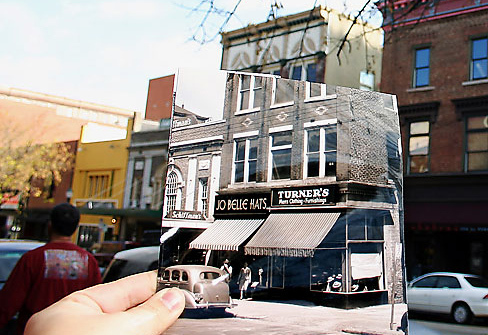 Throughout the 18-month project (Windows to the Past: People, Places and Memory in Downtown Greensboro), Sam Berton, Amelia Gallo, Stephanie Krysiak, Kelli Landing, Felicia Lowrance and Alaina McKee recorded oral interviews with longtime business owners, customers and characters  the people who knew downtown best. They also examined structures and pored through city directories, deeds, census records, photographs, fire insurance maps and classified ads. For the final phase of the project, the students designed three ways to share their findings with public audiences  mounting a series of exhibit panels in 15 downtown shop windows, creating a self-guided walking-tour brochure, and collaborating with graduate students in UNC-Chapel Hill's Digital Cities class to launch a virtual tour. In February, Filene and his students were asked to present their project to the NC Humanities Council Board of Trustees. In April, Felicia Lowrance and Alaina McKee presented the project as part of a poster session at the National Council on Public History's conference held in Milwaukee. In addition, a full set of exhibit panels is on long-term display in the Greensboro Central Library's reading room downtown. The project was made possible in part by a grant from the North Carolina Humanities Council, a statewide nonprofit and affiliate of the National Endowment for the Humanities. Key collaborators included Action Greensboro, Downtown Greensboro Incorporated, Elsewhere, the Greensboro Historical Museum, the Greensboro Public Library and Main Street Carolina.